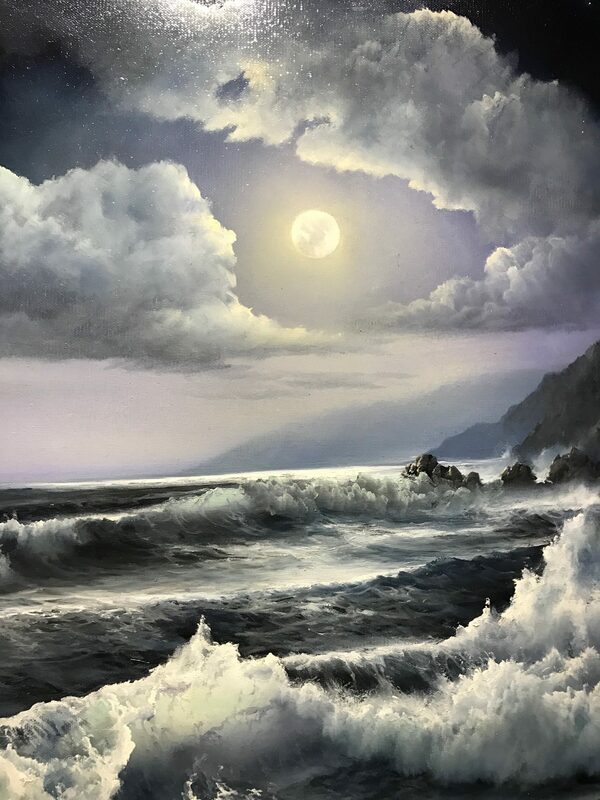 Judy Dy’Ans is an American Painter who has been painting for over 4 decades, has a piece hanging in the White House, and captures seafoam and the translucence of the waves using an eggwash technique of oil on canvas. Her Koi paintings have won numerous awards and accolades as well. Born and raised in San Francisco, Dy’Ans learned her trade from her Grandfather by painting on anything that was available. From paper and glass to wood, old window shades and eventually canvas she applied all the techniques taught to her by art teachers along the way. Married to a military officer, she has traveled to many varied and exotic places around the Globe. Fascinated with color and texture, Dy’Ans work is alive and fluid. Whether it’s the beauty and majesty of the sea, ocotillo cactus in bloom along the desert floor or koi-fish sailing smoothly through lily covered ponds, her subject always seems to be a symphony of glowing color. She attributes her ongoing success to artists she admires such as Vermeer and Corot, and her opportunity to study with such noted artists as Bennett Bradbury and Bill Yelland.